“Salesforce Integration” was first out of the gate in May 2006. This is roughly when AppExchange was first launched. 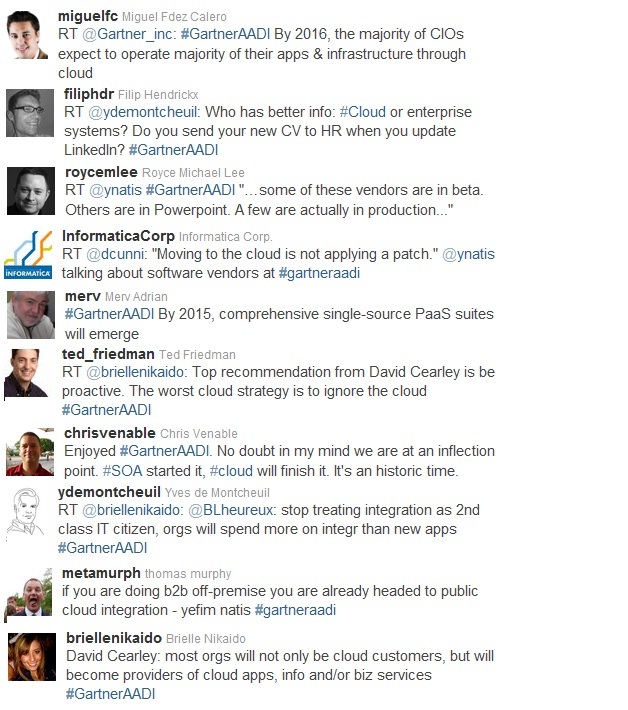 “SaaS Integration” entered into the vernacular in 2008. About the same time the term “on-demand” died I suspect. SaaS integration hasn’t done so well as a term, however. I put in SaaS application integration and it only made matters worse. This was a bit of a surprise I must admit. “Cloud Integration” made a dent in October 2008 and has been on a steady climb ever since. But back to the keywords. I put in the terms “Data Integration” and “Application Integration“ to compare and they’re an order of magnitude greater than all three, albeit with a much longer history. Of note, however, is that the trend line for both of these more mature terms was on the decline for a few years but now seems to have leveled off somewhat. There was also a track with significant cloud content called: Architecture for Postmodern IT: SOA, WOA, EDA, and Cloud. That’s to Gartner for a fantastic event! Lots of great sessions, customer and analyst discussions. With SAP’s announcement of their acquisition of SuccessFactors, 2012 is definitely shaping up to be the biggest year yet for cloud computing adoption in the enterprise and cloud integration will continue to be a hot topic. I like this slide presentation published on eWeek by Chris Preimesberger – Cloud Computing: Cloud Application Integration: 10 Key Trends to Follow. Good graphics and some solid take-aways on the importance of integration to cloud computing adoption and success. 77 percent of companies expect to implement at least one SaaS application in the next two years. The number of enterprises expecting to implement at least four SaasS applications will double from 17 percent to 33 percent. 57 percent of enterprises expect data volume to grow more than 25 percent in the next 12 to 18 months. 45 percent of enterprises cited a lack of integration as the largest roadblock in fully harnessing the value of applications and data. 56 percent of enterprises believe easily connecting applications and data would free more time for staff to work on other business initiatives. 50 percent of enterprises believe simple application connections would enhance flexibility, time-to-market and competitiveness. 42 percent plan to implement cloud solutions to address integration in the next two year, if not sooner. Be sure to check out the complete eWeek article here. What impact is cloud computing having on traditional IT roles and responsibilities? What are some of the barriers to adoption of cloud-based applications and platforms? What is the role of data integration as it relates to cloud computing? Can companies move incrementally to the cloud without making a full-on commitment? What about service-level agreements? How should they be enforced with cloud vendors? What sort of architecture should companies look for, especially for BI and data warehousing applications? What about performance concerns, especially with large data sets? How is Informatica addressing the cloud computing opportunity and challenge? As there doesn’t appear to be a comment section on the site, I’d appreciate any feedback or comments you might have on the discussion. When it comes to which path to take, I actually don’t see as much distinction between the layers and I don’t believe there are necessarily different tools that apply to each one. Sounds like he’ll be going into more details in subsequent CIO.com posts. Be sure to read the full article here. Am I the only one who hadn’t heard of Greg the Architect until today? This is pretty funny stuff. The marketing guy and his iScream is particularly good. According to Forrester, integration is one of the top concerns people have about cloud computing. Therefore it is going to be one of the main drivers of user adoption of the cloud. Integration cost and duration, integrating software as a service (SaaS) and traditional applications and managing and monitoring interfaces are key challenges around integration. To respond to the integration challenges underlying most implementations, cloud vendors are now proposing SaaS integration solutions that offer an easy way to integrate systems compared to traditional approaches.